I downloaded this to my Kindle ages ago., when it was on some sort of special offer. It then kind of sat there for months (or even years), but finally I was idly browsing my e-library, and remembered it. And read it, of course. 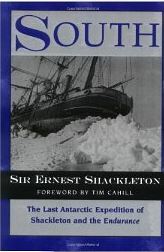 It is the account of Shackleton’s extraordinary Antarctic expedition in 1914. His plan was to traverse Antarctica, with one team setting stores on the Australia side of the continent and then retreating, and Shackleton then traversing from the other side with dogs and sleds, picking up the stores left by the other team as they crossed. Things went rather awry right at the start when his ship got unexpectedly trapped in ice in the Weddell Sea. After several months in trapped in the floes, the ship was eventually crushed, and Shackleton and his team started a very slow and painstaking crossing of the frozen sea on foot, and then in small boats they had hitherto been dragging along with them. This took more months, all the time living in tents on the ice. They finally landed on the remote, frozen Elephant Island, and set up camp there. More months passed, and eventually Shackleton and some of his men set out to cross the wild Southern Atlantic Ocean in their tiny boat, taking many weeks to successfully reach South Georgia, where there were whaling stations. They landed on the other side of South Georgia, however, so Shackleton and his men had to then trek across the un-mapped, mountainous island to get to the whalers. Shackleton then chartered ships and managed to effect daring rescues of the men left behind on Elephant Island, as well as the team on the other side of the continent. The whole thing is quite extraordinary. Rather dry to be sure – there’s a lot of longitude, latitude and weather reports. However, the extraordinary hardships they went through, living in flimsy tents in the bitterest conditions, climbing each night into sleeping bags frozen solid with ice, extraordinary thirst and hunger, navigating across some of the wildest oceans in the world in a boat not much bigger than a tinnie – absolutely extraordinary, and quite riveting. If you’ve ever thought you were cold, or hungry, or faced a difficult challenge, you will change your mind after you read this book. It’s pretty inspiring. These men were cut off from civilization for three years, with no contact with the outside world – no radio, no messages, no possibility to call for help. And in that three years, World War 1 was raging, breaking out in the same week the expedition set out. When the men finally returned, they then threw themselves into that conflict with barely any time to rest. Some more bits and bobs from my travels, none of which are interesting to justify an entire article..
Who knew there was a bike share scheme running in Sydney? I came across this outside the Ibis hotel in Darling Harbour. Three dusty bikes, looking little used. Apparently helmets are available for free from the hotel reception. So that’s all right then. The CoS, of course, would like to implement a proper municipal system, but won’t do so unless there is a relaxation in helmet laws, in order to avoid the white elephants installed in Brisbane and Melbourne. 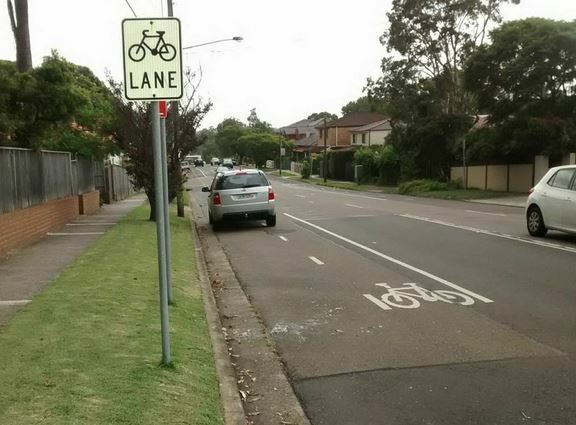 There’s a bike lane near where I work – or at least the sign for one. 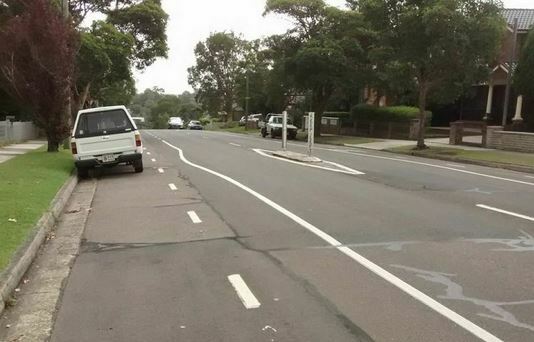 although whether this counts as a real one is not 100% clear, as according to the road rules it has to have a ‘start’ sign as well. This is the type of ‘door zone’ lane that has been associated with at least two fatalities recently, and cyclists generally would be well advised to avoid them – either take the lane or ride on that nice empty footpath. 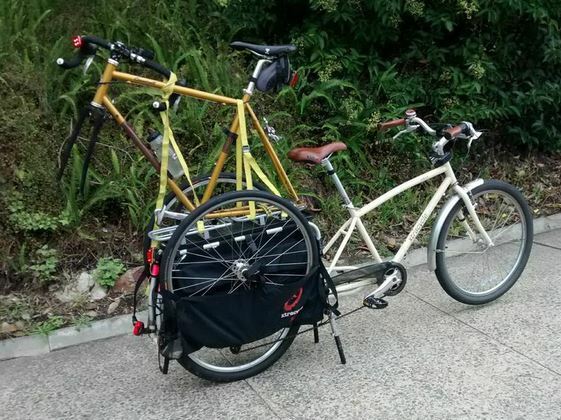 I once again recently ended up with a bike stuck at work, so needed to bring two home at once. It’s something I’ve done many times, but it does make me somehow happy to ride along with a bike on a bike. 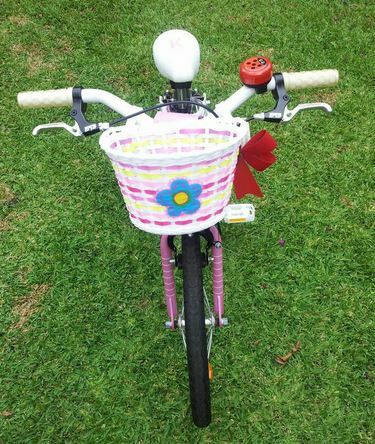 Chillikebab jnr wanted to up the practicality of her bike, so used some of her birthday money to buy a basket. Top choice, I say, and perfect for collecting interesting leaves, twigs and other artifacts from the park. Clearly a budding utility cyclist. The Chillikebab family went on holiday recently (well, not that recently really, but I’ve not been keeping up with my blogging recently…), enjoying a peaceful week in a rental house on the South Coast. The sun shone (mostly), the beaches were sandy, the beer was cold and there was time to relax. I always enjoy browsing the books on offer in such houses; usually a mix of yellowing paperbacks from the 1970s, strange non-fiction titles on random topics (‘How to build a Minibike’, ‘Advanced Topiary’, ‘Midwifery Careers for Modern Girls’ and so on), and a few bodice-rippers left by previous holidaymakers. This book is of course a classic, and with good reason. On the one hand a story of loyalty, courage and love, and on the other a horrifying tale of blank, hollow lives lived as victims of circumstance. It is concise and pithy, with rich characters and sparse, taut dialogue. 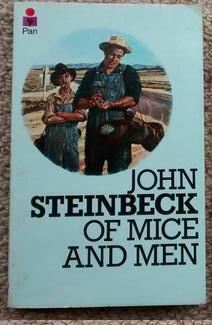 As George and Lenny chase their dream; to own their own rabbit farm, it is always obvious that they will not succeed; there is a kind of awful inevitability about the ending that makes it no less arresting when it does. If you haven’t read this as an adult, and only know of it from adaptations or schoolwork, it’s worth picking it up.